Hi guys, congrats for the debut album. First of all, I want to know a little bio about the band. IGOR: Thank you! The story behind the band was born on a wedding of our friend Bostjan Klun in 2009. Tadej was playing the “wedding song” on a roof of a building and that was the first time Tomaž saw him play guitar. After the ceremony the two of them started to talk about music and eventually it led to a classic late night idea: “Let’s start a band”. It took them a year to get together after that night, but then they managed to record some demos really fast. Tadej gave me the demos I asked me if I want to be part of the band…of course I was thrilled about the idea. A few weeks later Danijel joined us and we were ready to rock. 2) How was the process of writing and recording of ‘You Are Me’?. IGOR: From the moment we had a full line up it took us another year to finish all the songs that are on You Are Me. There were some that didn’t make it to album, but for the others it was a long run…we worked really hard until every one of us was entirely happy with the results. The recording process was really long, but I think it was worth it. Our producer Andrea F took the song and the sound to an another level and we’re really glad we meet him. Most of the album was recorded at Mushroom studio in Italy…it was one of the greatest musical experiences in my life. The studio is situated in an old stone house in the middle of nowhere with no internet, phone signal or any other sign of civilization…beside tons of studio equipment, of course. We were there focused only on the album, on the music and on our band. The album is the result of the energy and harmony that was created in that specific place and time. After the additions that took part in Studio Hendrix in Koper, Slovenia, in 2016 the album was finally ready. We released the album first in Slovenia and later, in September, it was released worldwide by Rock Company label from Netherlands. 3) What’s the meaning of the title? TOMAZ: We live in a greedy period when earnings are more important than living beings. We live in a time when love is measured and evaluated in euros … Love can’t be measured! In short … We’re losing it. Because of the dominance of greed we became blind to compassion, for life. 4) What is the main influence for the band? I think that you cross classic hard rock with elements of grunge. TADEJ: The main influence of the band is really classic and progressive rock. I think everybody in the band grow up with Pink Floyd, Led Zeppelin, Rolling Stones and so on. But in the last years every one of us was exploring different worlds of music. And all that make our music sound the way it sounds. We hear often from listeners and friends that our music reminds them of Guns N’ Roses, or even more of the new Slash’s albums, of Foo Fighters,… and it’s a huge honor to be compared to those bands. I like to think that’s because we share the same influences. 5) How is the rock scene in Slovenia? DANIJEL: Slovenia nowadays has issues with promoting emerging rock bands. At the turn of the century in Slovenia rock music ruled… We are proud to have the chance to listen to rock music in Slovenia when it was still at its best. But it seems that more and more people listen to pop or ethnic music today. It is an alarming fact for true rock fans and music enthusiasts. We are expecting a positive turnout for the rock scene in the near future. Fingers crossed 🙂 . One must also realize that Slovenia is a small country with approx. 2million people…If you compare that for example to Rome in Italy you’ll understand just how small we are. Rome has more people than our country. 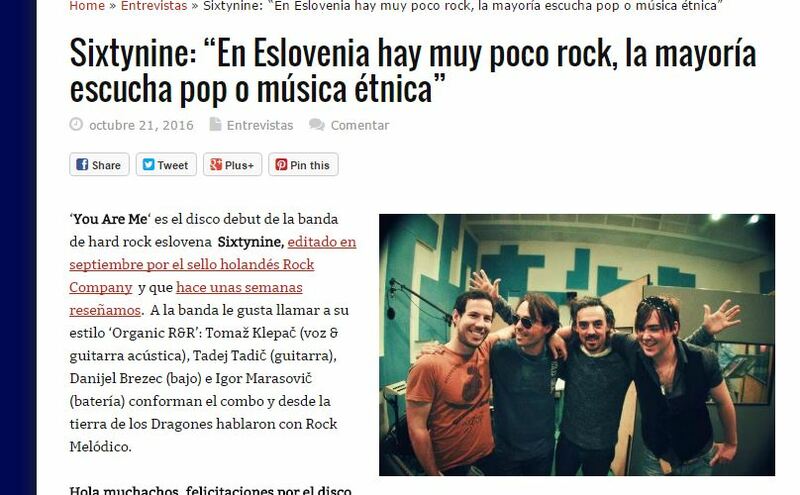 The comparison can show how difficult is to emerge in scene that’s so small and at the same time explains why Sixtynine choose to release the album” You Are Me” out of the Slovenian border. 6) How can people get a copy of ‘You Are Me’? IGOR: The album is available on the website of our label www.rockcompany.nl, as a digital release or as a CD. You can also get it on iTunes, Amazon or CDBaby. Or ask your shop! 7) What are your plans for this year? IGOR: We will continue to promote You Are Me, but sadly not on the stage at least for a couple of months. Our guitarist Tadej broke his collarbone a few weeks ago. He felt from a longboard at high speed. After his recovery we’ll start to write material for a new album. We really enjoy the process of creating a song…I think it’ll be fun and I can’t wait to see the results! 8) Thank you guys! if you like to mention something else for Latin-America and Spain, you’re welcome. IGOR: We looking forward to do some gigs near too you, we heard you’re an awesome audience! Keep on rockin’! Muchas gracias !